Mugabe the president of Zimbabwe is called the "Hitler" of Africa , he consider White as citizens of second category and he has invited population to evict the white of their farm. What does the ONU to stop this genocide? Milosevic had been judge by the TPI for genocide, but not Mugabe, why ? Because Mugabe is Black , and people don't want understand that there are Black racists. That's terrible The planet should be cleansed of those Simians once and for all. Africa is a backward hellhole, the only reason for the few advancements it has now is because of White people. I am sure those primitive simians will get theirs one of these days. When One's Entire Military is made of HIV infested Soldiers with Rusted AKs it can't be with Impunity forever. The Afrikaner people are in greet danger. They are facing genocide, and no one is doing anything about it. How much longer to the Afrikaner people need to struggle, to bleed and to die before anything is going to change (?). Since 1994 the white farming communities have been experiencing a terrible situation where farmers together with their families and farm workers have been murdered by the thousands under the noses of the ANC government. Accurate statistics for these murders are not kept by the South African Police nor the government. The only indication that we can get for these brutal murders and attacks are from private people and orginisations publishing media reports on some of these murders, this however will not be accurate as not all attacks are mentioned in the media. If we look at the figures given by these individual websites and some of them get to a figure of more than 3000 whites killed in brutal attacks, we can only come to the conclusion that these figures are actually much less than the actual amount of killings. In the whole of South Africa the estimated murder rate (all races) is approximately 52 people a day, some people say it can be as high as 60 per day, this is however very difficult to confirm as accurate statistics are not kept by the SA Police or the Government. What is making things even worse is that the conviction rates for these murders by the courts is approximately 12% (News24). Conviction rates for contact crimes is only 19% (DA), this indicates that the current government, police force and judicial systems in South Africa has failed to provide a secure enviroment for any person within the borders of South Africa.The media always covers the sucessful arrests and convictions, but never report about the more than 80% of cases never solved. The South African government is constantly saying that they have crime under control, but how can it be under control if the murder rate is at the current levels and the conviction rates indicate different? The government has signed into law the disbanding of one of the most effective crime fighting units called the "Scorpions" in a time when not only murder but corruption and other crimes are at the highest levels in the world. Is this the kind of democracy the world screamed for? How can anybody in his right mind accept the death of thousands of innocent people as a fair price for democracy? The world needs to speak out against this murders as they speak out against similar situations world wide. 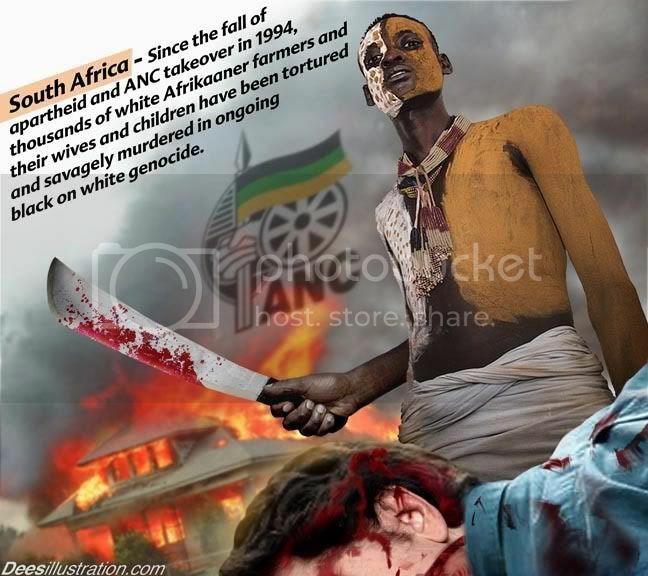 For more information on Genocide in South Africa. African-ruled countries are a variation on a theme of total corruption, and it is a matter of time before South Africa collapses. The 3.5 million Whites remaining might slow that process but the end result is inevitable and Western elites and journalists must take responsibility. The puppet masters will not shed a tear to see the white man go extinct in Southern Africa. It is much easier to corrupt an illiterate african than a Boer who loves his country. We did not see US or British marines line up to defend helpless white farmers in Zimbabwe from a tyrant and a murderer. The farmers had to watch helplessly as their land was seized by war veterans who were not even old enough to have fought in the Rhodesian war, I am talking about the farmers who lived to tell the tale. Unfortunately for the farmers, Zimbabwe has no oil, thus there was no need to put their President on trial for crimes against humanity. Southern Africa has a vast amount of mineral riches that can still be exploited, and the multi-national corporations see that billions of dollars can be made with a minimal cost in labour. It makes economic sense to wipe out the only people that can not be corrupted, by being in their nature patriots, the Afrikaner will not sell their soul to the devil. FW de Klerk was unfortunately one who had to go and put the Afrikaner to shame, that is why he chose to move to the UK, go figure. The Afrikaners get angry just hearing his name, the Nobel prize was not for peace but for winning the prize of selling out his own people. I wonder if the media that was so persistent in documenting the evils of apartheid, had taken photographs of white farmers being burnt to death by hot water, and their wives and children raped by HIV positive armed gangs. If you survive the attack you will die of Aids, and another farm can be taken to give to the masses.